Prithvi is spying on Rishab who is collecting Roses, he hides and calls Sherlin asking her to come to his room because his is heading there and if he recovers from the drugs then there will be no point for anything. He thinks that he will take Preeta away from him and everyone else. Prithvi hears that Dadi and Janki are coming all of them are completely drugged and not able to understand what is happening he tries to convince them to not sit and come back, He then scares them that if they all will sit then he will be get caught by the police. Everyone is not listening to him and he finds it very difficult to take them away from Rishab. Rishab says to himself that he is going to give it to Preeta and be lost in her love. Preeta is taking the Thandai when Rakhi comes and starts asking for it, when Preeta refuses Rakhi gets mad, Karan sees this and comes to help her, he takes it from Rakhi, Preeta takes it when she asks as to whom did she made it she says that it is for Sherlyn, both get tensed and then try to make an excuse, Karan makes her go away. When Preeta leaves, Rakhi starts to scold Karan, he finding the moment calls the waiter and takes the Thandai giving it to his mother. Rishab gets into the room and is wondering where Preeta is, Prithvi takes Dadi and Janki to the hall, they both are very difficult to control as they are drugged, he signals Sherlin that Rishab is alone, she immediately heads to the room. Preeta holding the glass both wonder how they will make Karan drink I, Karan takes it and confusing Rakhi give the glass to Sherlin, both drink it and Preeta, Karan are happy to see that she has drinked the whole glass. Rishab is in the room and looking for Preeta he is not able to find her, he wonders if she is playing hide and seek with him so he decides to find her. Rishab says that he is not Karan so she must not play it with him. He is not able to find her getting completely lost in drugs. Sherlin excuses Rakhi that she will find her mother but Rakhi refuses and goes away. Sherlin heads towards the room, Preeta stops Karan mentioning that she has mixed a lot of bhang so soon Sherlin will be out of her senses Preeta decides to follow her. Janki and Dadi are making havoc in the hall, Sarla sees them both and judging the condition they are in she takes Janki away from Dadi so that the effects of the drugs can wear off. Prithvi comes back to Dadi with the phone, he gives her phone to her but she is not able to comprehend it and asks him to bring her more Bang, he thinks why they drink it when they are not able to control it. Prithvi thinks that Sherlin needs his help so he will go to her and check if she is in any trouble. Rishab is not able to find Preeta anywhere in the room, he is still completely drugged and not able to control his actions, Sherlin is walking in the hall when she feels dizzy and collapses, Prithvi comes and sees that she is on the floor, he asks her to go and destroy Rishab but she says that she is feeling dizzy. He says that they made a plan to destroy Rishab and she cannot back out from it at this moment o she must go there at the earliest without any worries. Sherlin enters the room, Rishab is in his bed, she goes to hi as soon as he sees her he gets away, and blaming her for lying because she said that Preeta was waiting for him in his room but Preeta is not there. Sherlin tries to take advantage of him but he pushes her away so that she can keep away, he makes her realize that these are bad manners and they must not do anything of this sort, even though she is a good looking girl yet he cannot marry her because his heart beats for Preeta, he collapses on the bed, Sherlin also gets unconscious. Precap: Preeta asks Prithvi if he is okay, he says that she is looking very nice and he loves her a lot, Preeta hearing this slaps him very hard. 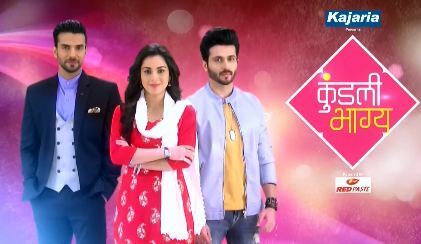 The post Kundali Bhagya 13th March 2019 Written Episode Update: Sherlin also drinks Bhang appeared first on Telly Updates.